What I am about to share with you in relation to adjusting Grass European cabinet hinges also applies to all brands. These style hinges have three different types of adjustments. One screw moves the cabinet door up and down. Another will cause the door to move side to side. The other screw will realign the door in and out with the face of the doors on either side. The screw that controls the adjustment which moves the door left to right should never be unscrewed too far in the direction where it is moving the cabinet door away from the side of the cabinet. 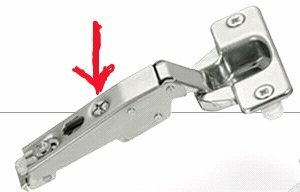 This is a huge problem with the Grass brand European hinge because the screw will unscrew from the metal that it is threaded through and the hinge will come apart. When this happens it becomes a very frustrating task to try and get the parts assembled back together. Usually this problem occurs when the door margins or gaps between the cabinet doors are to wide. Stay within the boundaries of the allowable movement or else you will have a hand full of hinge parts to put back together. Usually the home owner will try to lesson the space and adjust the Grass hinge too far out and it falls apart. It’s best to leave the large gap. Usually, the professional cabinet installer who adjusted the doors in the first place knew that they were cut or ordered too small. So, when he was making the final adjustments to the Grass hinges, he was careful to not over extend the allowable boundaries of the hinge’s adjustments. Tip: If your hinge adjusting screw came unthreaded from the metal it was inserted in, it’s going to take a lot of pressure to get it screwed in again. You must remove the hinge from the plate that is attached to the cabinet before you will be able to get it to rethread. As previously mentioned, this is a problem with many of these types of European cabinet door hinge brands, but specifically a nightmare with the Grass hinges. I have been hired many times to fix what customers messed up when they were adjusting their own hinges.